The newly revised version of the Learning Breakthrough Program™ is an accumulation of the most successful activities identified over 14 years of development and first published in 1982. 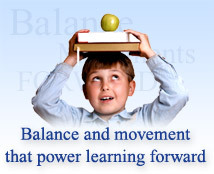 Once used only by developmental specialists personally trained by Dr. Belgau, the program's creator, the Learning Breakthrough Program™ is now structured and organized into daily activity segments making it easy to use by any clinician, educator or parent without the need for specific training. The program can be used as a stand alone therapy, in conjunction with other therapies, as a "homework" product that supports the efforts of teachers, tutors and therapists and as an at-home learning aid for anyone interested in the range of benefits associated with better brain processing ability. Adults are now able to use the program at home, on their own or with their children. There are a variety of developmental specialists that use the program along with other intensive therapies in order to enhance their treatments. Many practitioners will encourage patients to use the program at home each day, not only while receiving treatment, but as a tool that helps consolidate therapeutic gains when formal therapy ends. For those interested in intensive therapy, we are glad to recommend developmental specialists or occupational therapists in your area who we know to be conscientious and highly qualified. These therapists will use a variety of different techniques and methods that will complement and may add to the benefits of the Learning Breakthrough Program™. When you purchase the Learning Breakthrough Program™, you receive easy to follow instructions, all the necessary equipment and a work-along video DVD that makes it fun a simple to administer in your home. You can be using your Learning Breakthrough Program™ within 15 minutes of receiving it. We are available to answer any questions you may have as you begin the program and are always available to support your efforts. If you have any questions, simple email us at brotmanp@verizon.net or give us a call at 212-222-5665. The frequency and consistency of activities is crucial to maximizing improvement. The more often you perform activities the better! To get the most out of the products, we recommend that you use them everyday, preferably for 10 to 15 minutes in the morning and 10 to 15 minutes in the afternoon or evening (just before doing homework is an ideal time). It is our hope that the activities become a part of your daily routine, just like brushing your teeth. The importance of doing the exercises every day cannot be stressed enough. We realize that it is not always possible to do the exercises twice everyday, but do the very best you can. If you miss a day, just jump back in as soon as you can. Very often clients see positive benefits right away and may be tempted to relax the amount of time they devote to doing the program. Please do not. The cumulative effect of performing Learning Breakthrough activities over an extended period of time can be astounding and it is exactly this sustained effort (over the course of 9 to 12 months) that leads to permanent changes and strengthening of the neural networks involved in efficient brain processing. Choose a schedule that works for you and try diligently to maintain it. The longer you use the Learning Breakthrough Program™, the better! You should make at least a 6 to 12 month commitment of daily use. While some experience dramatic improvements right away, our experience indicates that most people can start to experience lasting improvement in as little as 12 weeks of daily use. Many people use the program for 6 - 12 months and are happy with the improvement they achieve. Some continue to use the program on a less structured basis thereafter. The program manual includes a number of tests. We encourage you to use these tests as a way to benchmark progress. We also recommend that you keep a journal or file with information about the user that will help you compare their performance as time goes by. Sometimes changes are very gradual. As an example, being able to compare handwriting and reading speed after 3 months of program use against pre-program sample can provide valuable feedback and motivation. It takes a commitment of daily use to get the most out of the program. When you and/or your child experience positive changes, your motivation to stick with it becomes much better.